As an entrepreneur or startup with a great new idea, you need to communicate with many stakeholders. Your users and consumers, the media, potential investors… the list is long. You have to start thinking about a professional logo design for your business. You require a brand identity system as well– the foundations of your future brand. Where do you begin? Here is a definition of the basic building blocks for the design of your company logo. It is followed by a step-by-step professional guide on how to go about it. A logo uses a form or a collection of letters to represent your company that can be read at a glance. When the letterforms are more prominent it is referred to as a logotype. A brand identity is a system of usage recommendations for the logo across digital and print media. These recommendations include fonts, colours and associated graphics. These recommendations make the logo look consistent and powerful across channels. What goes into the making of a brand? Walter Landor, founder of the global branding firm Landor famously said ‘Products are made in the factory, brands are made in the mind.’ A brand is the holistic way the end user perceives your company or service based on its visual appearance and quality. It is both the tangible and emotive image of the company. How does brand strategy help start-ups? Brand strategy provides substance and structure to your new product or service. It helps start-ups focus on their offering. To sound genuine and be effective, a brand’s logo and its brand identity system need to rest on strong business strategy. Here is a useful link on getting started on strategy for your fledgling brand. What do logo designers do? Professional designers invest time in researching logos of your competitors and then come up with the best way to represent your company, using imagination and their knowledge of form and colour. They present options before deciding on the final. The time spent and the number of options depends on your agreement with the logo designer and the project cost. Where can you find a logo designer? Contact a professional branding and design firm. Branding firms work for different sizes of clients. Most have forms on their websites for potential clients to leave their email IDs or contact phone numbers. If you are confident of your creative abilities, explore online portfolio platforms Behance or Dribble. Mail designers whose work is close to the kind of logo you have in mind. While briefing the designer, state the vision and objectives of your business. Clearly put down what you expect in terms of deliverables. A comprehensive logo and brand identity brief is being worked on at present and will be up soon in the Amplify blog. How do you shortlist the options sent by your designer and what kind of feedback can you give? Look online for logos of established mobile payment apps and shortlist them by applying various filters. Is your app start up associated with any large bank, phone company or existing online service? Should the logo design of the app reflect the parent organisations branding? How strong should the visual link be? A little? A lot? Is your app a standalone one? Then shortlist these logos. SELECT 3-4 LOGOS THAT COULD BECOME YOUR CLOSEST COMPETITORS AND HAVE A GOOD LOOK AT THEM. What kind of shapes, colours and fonts are these logos using? Which logo design is the easiest to read, up close and from far away? How memorable are these logo designs? How many can you recall after a couple of hours? Business verticals have their own visual shorthand cues. For mobile payment apps, an icon of a pocket or a wallet is often used. 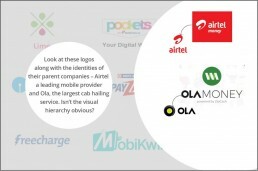 How different should your logo to be? 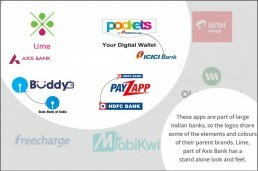 Look at the logo of Lime, a mobile payment app from Axis Bank. Lime is designed to stand apart from the others in the same space. COMPARE THEM WITH THE OPTIONS SENT BY YOUR LOGO DESIGNER. Which logo option stands out? Which logo option merges or looks similar? Are you subconsciously seeking a ‘me too’ look? Be aware of legal complications if you go in for a logo that looks very similar to a major competitor’s logo. To be successful, logo design and brand identity projects need to be collaborative. At all stages keep communication lines open with your designer (and vice versa). A good designer fine-tunes different elements, colours and fonts to suit your needs and holds your hand through the process. THESE IMAGES HAVE LOGOS OF GREEN BUSINESSES AND LOGISTICS COMPANIES. TRY APPLYING SOME OF THE ‘FILTERS’ USED EARLIER TO ANALYSE THEM. Brand identity guidelines make sure a brand’s communication content and appearance is consistent across media and channels. The unique needs of your business dictates the guidelines for your brand. At the time of hiring your designer list out all the places your logo needs to appear in. This will allow the designer to accurately estimate the work involved and you will get a satisfactory end product. Loka Energy has a brand identity that goes across business cards, responsive website, company vehicles and T-shirts. Developers of mobile apps will find Google’s clearly defined UI branding guidelines useful. A well thought out logo and brand identity system makes you appear professional and market ready. Your business offering will be taken seriously and doors open at networking events and banks. A well designed brand identity system lays down strong foundations for the future success of your business venture.